Enough wind energy is being generated in Spain to power more than 29 million homes every day, according to one of the country’s biggest renewable energy companies. While Australia debates the future role of renewables after the blackout in South Australia, Spain is determined to remain one of the global leaders in the field. Spanish firm Acciona gave ABC News access to its control centre in Pamplona where it monitors 9,500 wind turbines around the world on a minute-by-minute basis. A large screen allows employees to zoom in on specific wind turbines — some up to 17,000 kilometres away in Australia — and determine if the blades are pitched perfectly or if maintenance is needed. “The important thing is to predict and forecast what is going to happen,” the centre’s director Miguel Ezpeleta said. During the night in November last year, wind energy provided 70 per cent of Spain’s electricity needs. A daytime record was reached in January 2015, when 54 per cent of electricity use was provided by wind. “It’s incredible. Some years ago people would say we would be crazy people saying these kinds of things, just dreaming but today it’s a real situation,” Mr Ezpeleta said. But he was adamant the peak of 70 per cent was not the limit. “I think people are going to tell me we’re crazy but I’m pretty sure we’ll arrive at 100 per cent for one moment for sure,” Mr Ezpeleta said. The European Union target for 2020 is for Spain to reach 20 per cent of all energy needs, including electricity, heating, cooling and transport using renewable energy. It is currently at 17.4 per cent — just below that target. Every July, thousands of tourists come to Pamplona for the famous running of the bulls. But the area is also renowned for being the Cradle of Renewable Energy. It was here the power and possibilities of wind were recognised in the 1980s. Spain is not rich in oil or gas and has very little coal, so it either imported the resources or began finding other ways to create energy. Spain’s mix has been very broad. Nuclear power accounts for 20.9 per cent, while natural gas and coal are both just above 15 per cent each. There is no talk of closing down Spain’s nuclear power stations, but they do want to decrease the amount spent importing fuel from elsewhere. And that is where wind comes into the picture. At the El Vedadillo wind farm, 60 kilometres south of Pamplona, the turbine blades spin slowly, casting shadows on the ground. The nearest village, Falces, earns a third of its yearly budget from the surrounding wind farms. Its Mayor Valentin Garcia said residents were happy to rely on renewable energy and he could not remember the last time there were any blackouts. “There’s a very good perception of wind technology because of two reasons,” Mr Garcia said. 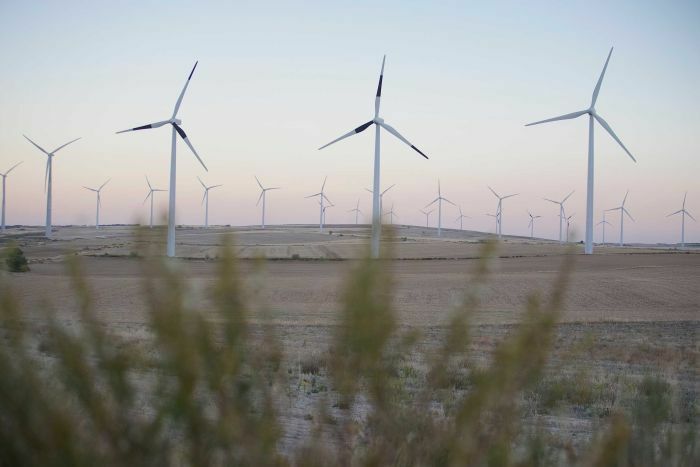 Critics said renewable energies had not brought down electricity prices in Spain, in fact some suggested they had increased as much as 60 per cent since 2006. “Every day is getting more expensive. I don’t know if it’s because of the taxes or why,” Falces resident Maria Angeles Verjara said. One argument is, while wind is cheap, there will always be the need for backups — because wind is unpredictable and keeping other power sources, like Spain’s nuclear power stations, operational is costly. But Acciona executives disputed those criticisms and director for the Asia-Pacific region Javier Montes said countries should not be discouraged from setting high renewable energy targets. “Properly managed, there should be no issues with that. The examples in Europe show that,” Mr Montes said. Originally reported by the Australian Broadcasting Corporation (ABC).